Modular outdoor kitchen units come with everything needed to get that perfect configuration. They eliminate all the hassles of buying the correct fasteners, end-caps, vents, brackets, etc. The pieces are 100 percent modular, as the main components are building blocks. In fact, you could say they are akin to a big, attractive, and durable Lego set. Modular units allow for a customized experience that's unique to outdoor kitchens. Customers choose from a wide range of styles and a seemingly endless array of patterns and colors within each style. Once an ideal compilation is complete, adding appliances and cabinets involves simply cutting out the pieces, which may be done on-site. This means customers are not limited to certain appliances and countertops. This type of customization is not possible with kits. 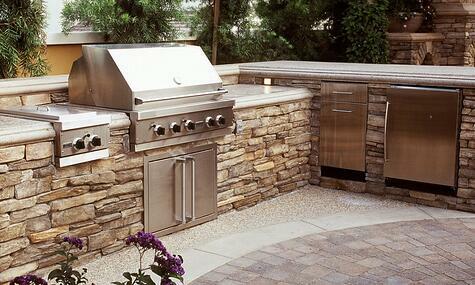 Compared to a traditional customized outdoor kitchen, modular units provide much less hassle for customer installation. Also, since all the components are included, you get much more kitchen for your money. For the same reasons, those who choose contractor installation will find the units more cost effective. 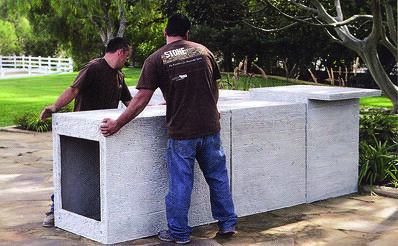 Outdoor modular kitchens are often built in hours and days rather than weeks, or even months. Glass-fiber reinforced concrete (GFRC) is the material for the highest quality outdoor modular kitchen units. It may be impossible to beat the durability of GFRC for outdoor projects. According to ConcretNetwork.com, The substance is reinforced internally, has no cracks for water to seep into, may be cut without chipping, and is not prone to surface defects. Such defects, referred to as bugholes, are common in the more traditional structural concrete material. Being reinforced means there is no need for rebar or concrete footings. Rebar installation and laying footing is not practical for many DIY'ers and makes hiring contractors much more costly. Pre-designed kitchens are more durable, leave more decisions to customers, and cost less than similar alternatives. Here at Valley City Supply, we love to help people make the home upgrades of their dreams a reality. When it comes to outdoor kitchens, we know that pre-designed modular units make for happy customers.